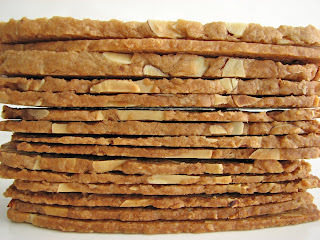 If you love the simple flavor of toasted almonds and the texture of a thin, crisp, crunchy cookie, this is your ticket. A recipe long replicated in the pastry kitchen of Chez Panisse, this cookie is delicious all by itself or as an accompaniment to your favorite ice cream. Or maybe take a handful, crush them into small pieces and line the bottom of a juicy fruit galette or top a sundae or trifle or fool. Or turn them into a streusel or fruit crisp topping or..….whatever you please. You’ll love the rich yet simple flavor. In the Kingdom of Crazy Good Cookies, Pain d’Amande is a permanent resident. For the busy person in you, this cookie dough is a very quick mix. However, the dough must be frozen in order to slice thin wafers effectively. So plan ahead a bit and you’ll have a great supply. - This recipe calls for raw washed Hawaiian sugar, which adds to the cookie's crunchy texture and delicious flavor. C & H produces this type and it can be found at most large supermarkets. - The dough can be stored in the freezer up to 1 month. It should be tightly double wrapped. - Because they are sliced so thin, be careful not to brown the cookies too much or they will taste bitter. Heat butter, cinnamon, and water just until butter is melted. Do not boil. Remove from heat and stir in the Hawaiian sugar. Stir in the flour mixture and the almonds until well blended. Place the dough on a large piece of plastic and form into a rectangle block 3 1/2” wide and 1/2” thick. Freeze overnight. Remove the cookie dough from the freezer and let it sit for about 5 minutes to take the chill off. Using a thin sharp knife, slice the cookies about 1/8” thick and place about 1/2” apart on a parchment or silpat lined cookie sheet. 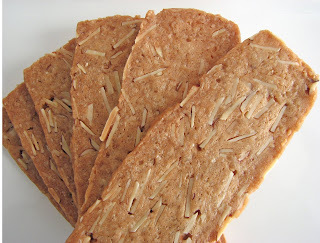 Bake for 10 minutes or until almonds just begin to take on color. Store in an airtight container for optimum crispness. Pain d'Amande Poetry. I love it. Cookie literature!